With the Presidential Inauguration being fresh in our minds, we have been thinking a lot about historical menus. A glance at the Obama menu juxtaposed against the menu served at Lincoln's second Inauguration say as much about the changes in our country as do shifting politics. Lincoln had four types of beef, three of veal, four poultry dishes not counting the quail and pheasant served as game. Menus are a great way to view history. Which brings us to Menus From History. Janet Clarkson is a food historian of great breath. Her blog, The Old Foodie, is a daily dissertation on all things culinary. Menus From History is a two-volume work published by the very scholalrly Greenwood Press and has a bent toward libraries. If you love food or culinary history it should find its way to your library. 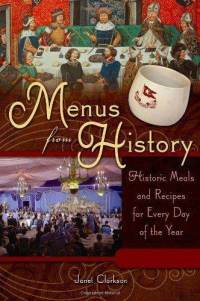 Menus From History is an exhaustive compilation of menus and recipes for every day of the year. September 23, 1387 is the Feast for King Richard II. May 10,1806 is the dinner between Chief Nez Perce and Lewis and Clark. There are Royal Dinners, Inaugurations, prison dinners, and Titanic dinners. Bread is broken with the rich, the famous and the ordinary. Pick a day -- any day and you will be transported. Today, January 24 is the anniversary of the day the Gourmet Society "went Arctic." In 1937 at Cavanagh's in New York, the Gourmet Society feasted on Eskimo Fare. According to the New York Times, the members "trifled" with Eskimo fare by eating reindeer loin, noting that "blubber and vintage fish" appeared only in speeches. If you have ever run across old menus, you will notice that while you might be given a listing of the food offered up, the menu does not include the recipes. For every menu Janet Clarkson uncovered, recipes had to be matched up. Clarkson goes to great lengths to keep the recipes as historically accurate as the menus. For this menu, she chose an oyster cocktail from a collection of church recipes from 1900. One dessertspoonful tomato sauce, one shake of tabasco, a sprinkle of horse radish, about half a dozen oysters, and the same on top. Serve in small tumblers on a plate with pounded ice around them and with oyster biscuits. The real problem with these two volumes is their totally addictive nature. You can't just read one entry. You just keep reading. Each entry has history and bibliography. The Gourmet Society's Candied Sweet Potatoes lead you to February 1, 1928 to the Broadway Association Dinner for the Dodge Brothers Electric Sign. And the Dodge Brothers take us to the 1919 and the 50th Anniversary of the Heinz Company on December 20th where one finds a recipe for candied sweet potatoes. If there is a single complaint about this work it is the prohibitive request for twice as much ephemera. There are plenty of black and white illustrations, but we are gluttons for more -- more photos, more menu card, more color! (All of this would push Menus From History to three volumes and triple the price, but ...) OK, maybe just one more thing...there are hundreds of texts referenced, but there is no full bibliography... so there are four volumes! This is really a pitiful attempt to even encapsulate this work. You will never look at a party the same way. Tomorrow? Burns Night.